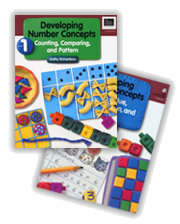 These books present a complete number curriculum for kindergarten through third grade classrooms. They are clearly written and each book provides simple but meaningful activities which give students repeated math experiences. These books present an approach based on years of research by the author on how children learn. They are a must for K-3 teachers of mathematics to meet the needs of all their students. Planning Guide: The Planning Guide includes comprehensive year long teaching plans along with classroom management ideas.